While most people think of Arizona as a desert region, much of the state is actually mountainous high country. Rather than endless rugged mountain peaks, the high country is predominantly rolling plateaus. 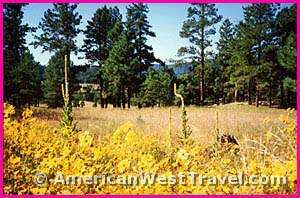 Much of the high country sits atop the Mogollon Rim which rises precipitously from the desert floor south of Flagstaff and cuts across the state towards the southeast. The Rim is moderately wooded in pine, and has plentiful lakes and streams. There are many options for such activities as camping, hiking, and fishing, making the area a favorite getaway for desert dwellers during the summer. Towards the eastern edge of the state, the general elevation is higher, around 9,000 feet, and there is more of an alpine feeling. 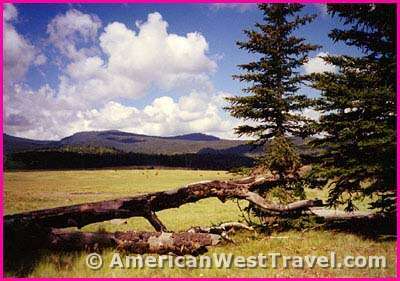 The photos, above and right, were taken in Lee Valley Recreation Area, in far eastern Arizona. The recreation area features an excellent campground, and there are six lakes within a short driving distance. 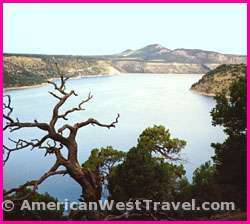 (Left), Hawley Lake is a favorite for rustic camping and good fishing. (Right), While Arizona lakes are heavily fished, there is still a chance for the occasional lunker rainbow trout as shown here.